This location is our main store where all the magic happens. It was first opened in December of 1987 kiddie-corner from here in the Berry Shops and we bought this building when it was available a few years later. You can come by and watch all the candy being made in our big picture windows in the front of the store. 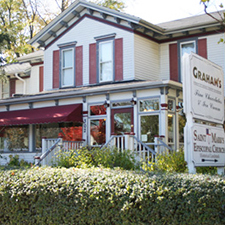 Everything is made fresh at this location, which features homemade chocolates and candies, homemade ice cream and even refreshing Italian sodas. 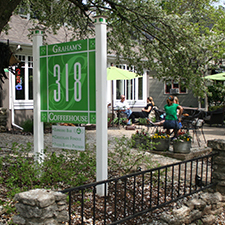 Graham’s 318 is our newest location, only two doors down from our flagship chocolate shop. This store is our coffee shop and features Metropolis espresso, pastries which are baked daily by our resident baker and a wide variety of Octavia teas. Come in the morning to get a buzz or cozy up in front of our fireplace in the evening and share a chocolate fondue with someone special. We offer free WIFI and there is seating available upstairs and down. We also rent our upstairs rooms out to small groups for meetings or small gatherings! *Our original location will be closed starting January 1st 2019 for Renovations, please visit our Pop-Up at 316 Franklin Street in the interim. 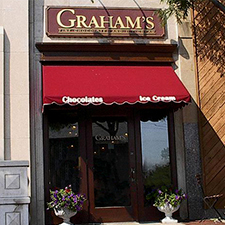 Our second location here in Wheaton was first opened in June of 2000 and serves as a quaint little retail shop and adds to the uniqueness that is downtown Wheaton. Homemade candies, ice cream and fudge are just a few of the yummy treats that are featured here. Close to the train station and the Wheaton College campus, this little store is easy to get to and has something for everyone! Stop by and gobble up one of our hand-dipped chocolate strawberries!